Most of the images that go into making our weekly banners come from the giant photo-sharing site flickr.com, which now hosts somewhere over 3.6 Billion photos. It's an awesome resource. In accordance with Flickr guidelines, we always include a link back to the source page of the image, or the main image if it's a composite of several. If you haven't tried it, the "IMAGE GALLERY" link is found in the bottom left hand edge of the banner, just below the descriptive text. To see it your cursor must be over the banner. Just click the IMAGE GALLERY link and it will open in a new window or tab on your web browser. Now, instead of one photo, you get a whole gallery to look at while you're listening to the show. To find out more about any photo, just click the larger version and it will take you to the source page. Thanks, Flickr! 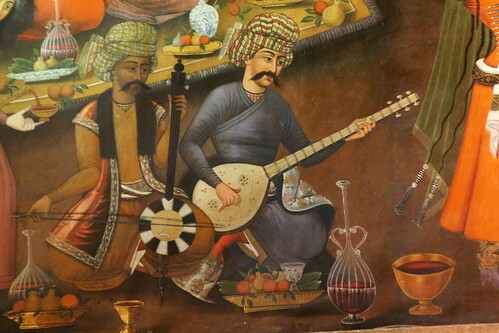 The music of the greater Middle East includes a range of cultures that stretched from Andalusian Spain and North Africa, through Turkish, Arabic, and desert lands to Persia and beyond. While these countries famously have their political differences, they also share a rich history of cultural exchange, common families of instruments, and musical traditions. One of these is the art of taksim (tock-SEEM) or improvisation within the modal system of notes and scales called makam (ma-KAHM). "Taksim" says Stellamara, "offers the player an infinite language to express the otherwise inexpressible...to travel far beyond imagination into the depths of places intimately known and never before experienced." On this transmission of Hearts of Space, a journey in Middle Eastern scales and improvisation called TAKSIM. Music is by STELLMARA, LUMIN, MARIAH PARKER, GUNNARD DOBOZE, PAOLO MODUGNO, MELANIE HUTTON & MARSHALL LEFFERTS, the YUVAL RON ENSEMBLE, AL-ANDALUS, and ANOUAR BRAHEM. What goes into making a program? As we progress in life things we like change, favorite movies/foods/songs etc evolve and change. We are rarely today what we were 20+ years ago. HOS is just about the only thing I can think of that is still a constant. Obviously some programs strike more of a cord than others but I still look forward each week to that hour where we enter another world. I'm sure your plate is full but should time permit I think sometime on the blog a short piece on what it takes to make a program would be interesting. How long does it take to put a program together ? Do you decide let's do a space week or a piano week or a change of season week. etc. Most radio music programmers are focused either on exposing newly released material — a form of music journalism that is supposed to aid the listener in "music discovery" — or optimizing a format composed of classic tracks in their genre. Once we have determined the musical theme and the schedule, the patient is moved to the operating table by loading all the material we have collected for that show onto our Pro Tools digital audio workstation. Pro Tools is a professional audio editor that we have used since it was released, but we could do it with any number of other programs. Our hardware is a little Mac Intel Mini, a 24" flatscreen, and Genelec monitor speakers, which is all we need. Then we begin a process of adding and subtracting, moving and changing, editing and tweaking that can take as little as a day or as long as three. Regardless of how long it takes, the object is to make sure that the individual pieces feel like an integral part of a larger entity, and the journey through the sequence feels natural, inevitable and correct. If it's just not working we start to think about a rerun, and remind ourselves that we work to a standard of quality, not a schedule. When this is done, it's time for some serious tweaking to fit the announcements into the first and last piece of music. 1/10th of a second more or less makes a difference for the pacing to sound natural; tiny volume changes to both the voice and the music allow the words to "float" over the background music and still be perfectly audible. And shorter is always better, so I edit and rewrite as necessary during the session. When everything has been checked and rechecked several times (more listening) we record the final show to the hard disk and then transfer it to another computer, where it is transformed into several other formats: one for public broadcasting, one for SiriusXM Satellite Radio, and several more for our own online service. We use special "batch encoding" software for this. Then we upload all the different files to distant servers, where they eventually find their way to you. This video is so totally in tune with Hearts of Space, both musically and visually, it's downright uncanny. The song by Barcelona is featured in this week's show "TIME OF TRANSITION." If spring is the season of hope, then it is fitting that in the spring of 1999, Sony Classical released an album by New York composer JONATHAN ELIAS, titled THE PRAYER CYCLE. This week we devote the entirety of this 25th Anniversary retrospective transmission of Hearts of Space to this extraordinary recording, which sums up several of the key artistic directions of the program in classical, world, ambient, electronic and vocal music — in a single piece. JONATHAN ELIAS is best known for his work as a composer of music for television commercials and feature films. But nothing in his resume would have hinted at the scope or the depth of this project, which Elias undertook in the period immediately before the birth of his first child. "I was excited by the possibilities for my child," he says, "but I also felt anxiety and sadness about the world she was about to enter. With all the wondrous advances of mankind, it was painful to acknowledge the other defining characteristic of the 20th century, which is more calculated and cold-blooded than any other period of recorded history. Is man's inhumanity to man as common in our nature as other forms of survival? With these thoughts and concerns, I began to write 'The Prayer Cycle.'" The effect of this brilliant multi-cultural, multi-language production is powerfully moving and very appropriate to the underlying message: "Prayer," says composer Elias," is what we turn to when the only thing we have left...is hope." THE PRAYER CYCLE... a eulogy for the 20th century... and a prayer for the 21st...on this 25th Anniversary edition of Hearts of Space. We begin this week with PAUL HASLINGER's tribute to late 1950s "space-age exotica," a genre popularized by creative, eclectic arrangers like MARTIN DENNY and JUAN-GARCIA ESQUIVEL. Lovingly revived in the early 1990s under the banner "Space Age Bachelor Pad Music" or just "Space Age Pop," its influences are still with us in the quietly expanding genres of Chill, Downtempo, Ambient Lounge and other variants of laid-back electronica. We're at the famous Burning Man gathering in the Nevada desert this week, but we've preloaded a show that's long overdue: our first retrospective of the seminal German electronic band TANGERINE DREAM. Thanks to Gintas Enrikaitis for reminding us that "it's time." The playlist has all the details — just click the link below. Have a great Labor Day weekend...we are!